Today's Prompt: Six Sentence Story. In this day of micro-blogging, brevity is a skill worth honing. Can you tell a story and make it short and sweet? What can you say in six sentences. 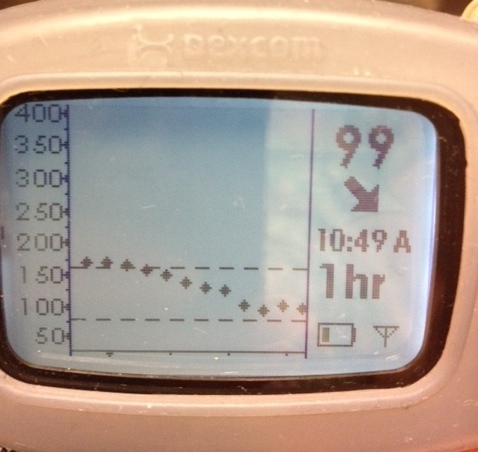 Diabetes often requires extra consideration, extra preparation. Some of my mom friends are planning a trip to the Dallas Zoo next week with their toddlers and I've been going back and forth about my ability to manage a heavy double stroller, a fussy newborn, a two-year-old flight risk, and my blood sugars in the Texas heat. So Hubster and I decided to do a dry run this weekend to see what it would be like for me. 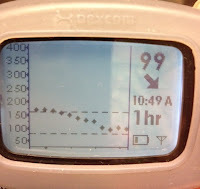 Checking my continuous monitor often, I caught one low blood sugar before I felt it (2 juice boxes - see left), watched a post-lunch high skyrocket to the 260s and made me feel like crap, and then couldn't catch the second low before it hit me like a hammer as we were ready to leave (2 more juice boxes). I had trouble pushing the stroller up the steep hills, my plantar problems had me limping by the third hour, and Hubster chased our daughter hurtling herself through the crowd at least a dozen times. While I like to think that diabetes doesn't stop me, sometimes all the juice boxes in the world aren't enough to stack the deck in my favor; I reluctantly changed my RSVP. Dibbs at the zoo. 10 weeks old. We will be at the Zoo this weekend for the boys 2nd birthday - but I'll have hubby, grandma, grandpa, brother Andy and his wife to help me!